DENVER -- Vice President Mike Pence visited Colorado on Thursday where he talked about tax reform. But it was his position on reproductive rights that spurred protests, CBS Denver reports. Pence visited Lockheed Martin in Littleton in the afternoon and then spoke at a Republican Party fundraiser in the evening in the Denver Tech Center. 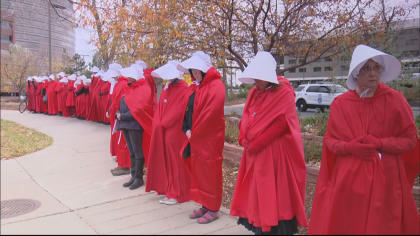 Protesters dressed as handmaids lined the streets on the way to the Denver Marriott Tech Center. The costume is in reference to the novel, movie and television show about a dystopian future society in which women are treated as property. They said they condemn Pence's stance on abortion, Planned Parenthood and the Affordable Care Act. An anti-Trump group organized the demonstration. "To let him know that here in Colorado we believe in women's rights, immigrant rights, worker's rights and human rights in general. So, we'll be here. We can protest all the way to the next election," said Indivisible Movement spokeswoman Sophia Solano. The fundraiser will benefit the Colorado Republican Party. The event sold 400 tickets, about half of the maximum capacity for the conference room. Colorado went for Hillary Clinton in 2016, and Pence told the crowd at the fundraiser that "people I know will in the not distant future are going to turn Colorado red." Pence recieved big cheers when he told the crowd "by the way, I always stand for our flag and our national anthem."